phoebe (and ofcourse terence) house has just been completed now and has received certificate of fitness and so on, we spent time and again to help owner to place beautiful paintings along the entrance walls and also in the living room and the childrens rooms. the house is very private but from what we have captured for the architecture, it remains open in plan, embracing a simple modern ethos, it is a very accessible layout not unlike any of the other buildings we done. the garden, and all the associated landscape elements had played a major role in the design process. 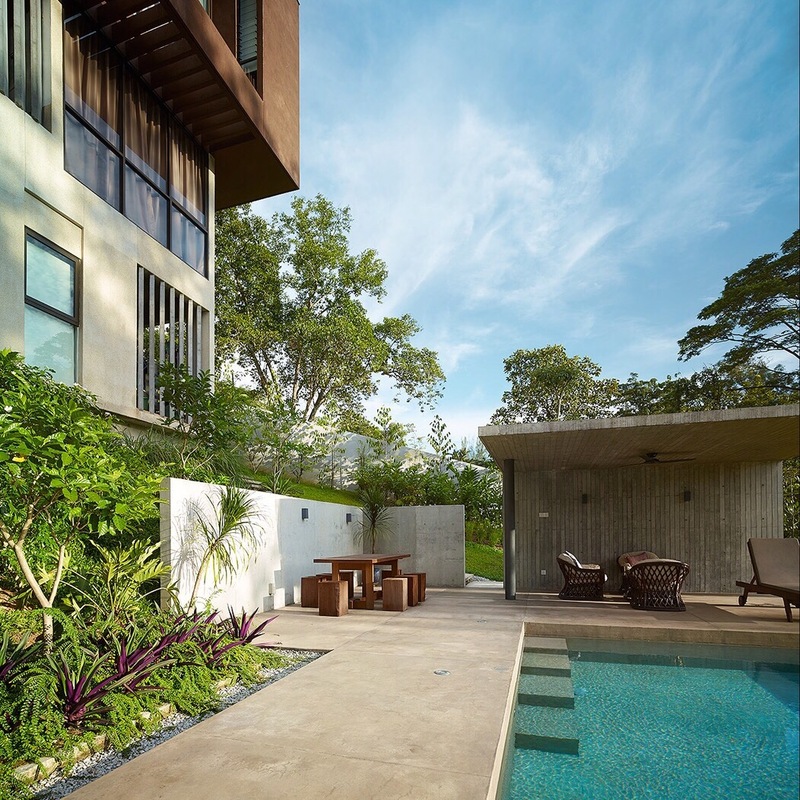 the long fenestration of both facades, front and back of the house is largely of exposed masonry construction, and for the upper part, brown tones achieved by using coloured concrete, meticulouly mixed and batched to give the earthy rich and organic feel to the wall. the bottom layer of the house links intimately with the lower garden and the slightly elevated but ground bearing swimming pool. this area is connected with walkways and can be seen from above the many open terraces. the main entrance is simple, guests would walk at first into a semi open lobby, before arriving at the main living room and hallway, which then feeds directly to the two different levels, one leading down to the garden and the other to the bedrooms. the front of the house is arranged to keep the structural mass low, and visually simple and quiet. the land slopes dramatically to the back, not seen until one has completely entered the house. the building look out towards a government training school in the back and on the right we see an old stadium. not the best sights in the area, but the entire living room has an enjoyable and uninterrupted view to the east side. lot of sun comes through in the afternoon, somewhat a challenge for the library. the project built up area is about 9,000 sqft and the total costs for the house came under usd 1.5 million. the site is approximately 30,000 sqft. the best part is the client, they have not altered any of the concepts proposed for the house, both have been very supportive throughout the long design process. we have been consulted for the choice of furniture and we are also pleased to have involvement in selecting light fittings and arranging artwork throughout the house. very little of what was originally planned for the house was altered or omitted, which made this project highly rewarding for both of us. 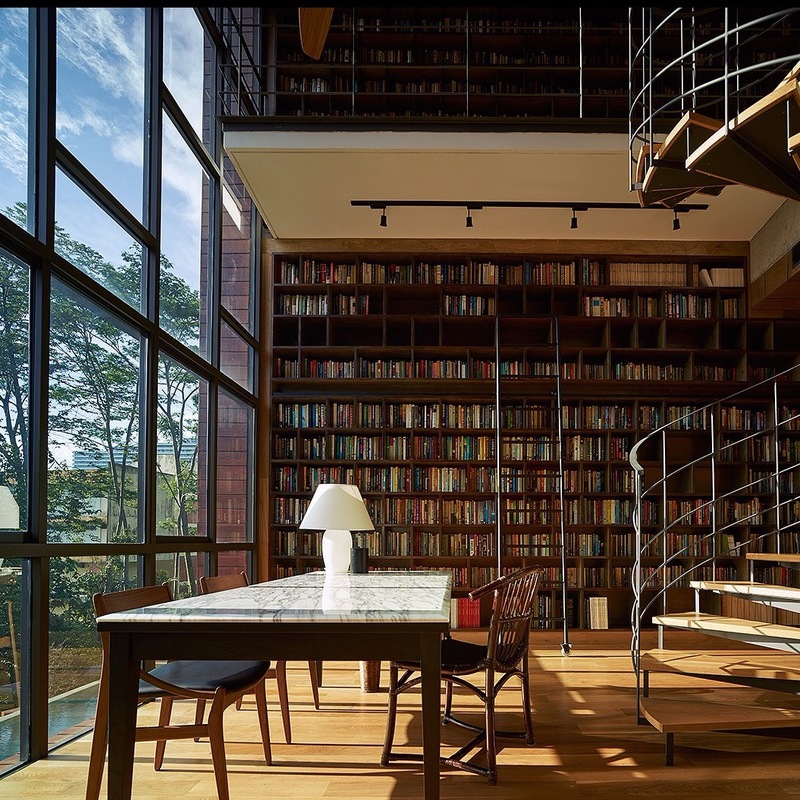 much of the softness of the house comes from the generous but careful use of timber for the floors and also the walls of the library and the some part of the canopy facing the garden.